Schloemer Law Firm salutes the Reigle family for its enormously generous donation of 31 acres to Village of Kewaskum. 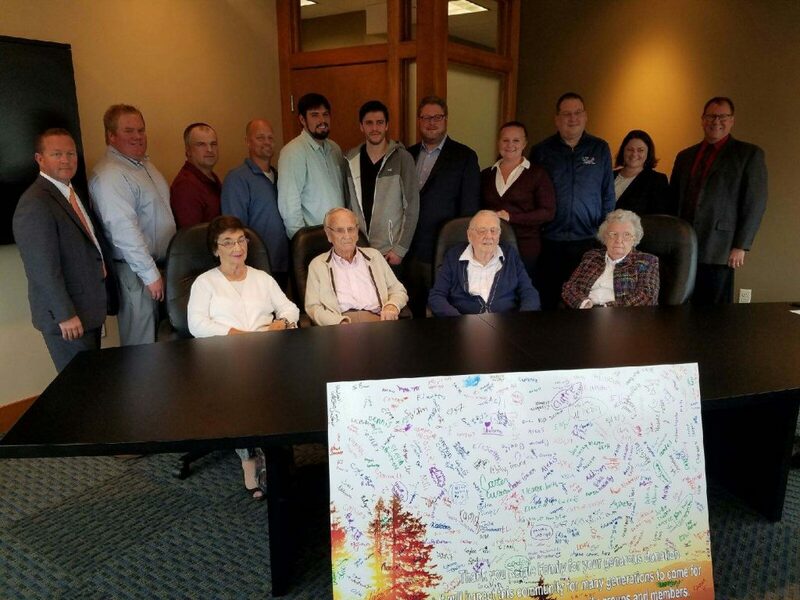 The gift was made official on October 12, when the Reigle Family and officials from the Village of Kewaskum met to sign the paperwork to transfer the property. The land, located on Edgewood Road in Kewaskum, will have several baseball and soccer fields that will be leased to the Kewaskum Athletic Association (KAA) and the Kewaskum Youth Soccer Organization (KYSO). Full use of the fields is expected by 2019. Attorneys at Schloemer Law Firm helped facilitate the donation by working with the Reigle family and Village officials in drafting the proper documents and in offering advice and recommendations to enable the gift to become a reality. The signing to transfer the property was recently held at Schloemer Law Firm; In attendance were members of the Reigle family, including Jim and Patricia Reigle, Village of Kewaskum officials, representatives from the KAA and KYSO, neighboring property owners Dr. Charles and Donna Ogi, Wanda Buettner of Abstract & Title Co., and Attorney James R. Danaher and Amanda N. Follett of Schloemer Law Firm. Mr. Reigle was prompted to make the donation after reading about the Village’s need for more athletic fields for its youth in the Kewaskum Statesman. The undeveloped land has a tax assessment of $649,700. A public meeting was held on September 6 before the property was accepted to receive comments and any objections or concerns about the land being accepted and rezoned from residential to recreational use. Another public meeting is to be held regarding further zoning considerations, and any recommendations will have to be approved by the Village Planning Commission before being put to a final vote before the Village Board. Funds to build the athletic fields and to maintain them have been promised by the KAA and KYSO. The lease to these organizations will also have to be negotiated. The Village is also looking to private and nonprofit investment for additional funding. Village Board President Kevin Scheunemann hopes to use water impact fees to run water lines onto the land. No taxpayer funds are expected to be used, and no increase in tax levies is anticipated. Community residents can expect the park and its athletic facilities to be used for many years to come. At Schloemer Law Firm, we believe in the power of giving back, and we welcome the opportunity to work with clients to invest in our community. The Schloemer Law Firm has offices in West Bend and Kewaskum and offers real estate, estate planning, and business services, and we can provide advice and recommendations regarding charitable gifting techniques. If you are considering donating funds or property to a particular charity, we can help guide you and explore the options that may be available to you. For example, gifts can be made at the time of death or during your lifetime. Other gifting techniques include various types of trusts, private foundation giving, transferring assets to a donor-advised fund, and creating a charitable gift annuity. There are also various tax advantages to you or your family depending on how you wish to donate. Call Schloemer Law Firm today to discuss how we can help facilitate your donation and strengthen our community.